Today I'll look at deaths in 1989. The CDC counts 12 legal and 1 illegal. I have 14 legal and 1 illegal. But one of my legal deaths was related to an undiagnosed ectopic pregnancy, a death that the CDC refuses to lay on the abortionist's door regardless of how irresponsible his failure to diagnose the ectopic was. 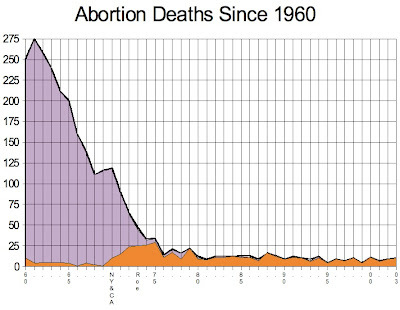 This means that there is at least one legal abortion death that the CDC failed to so much as notice. Eurice Agbagaa, a 26-year-old immigrant from Ghana, went to Abram Zelikman for a safe, legal abortion on January 7, 1989. Despite heavy bleeding, Zelikman left for the day, leaving Eurice in the care of an untrained receptionist. She died of blood loss. Charisse Ards was 20 years old, single, a mother of one. She died July 28, 1989, from a pelvic infection after a legal abortion. Brenda Banks was 35 years old and 13 weeks pregnant when she went to Hillcrest Women's Surgi-Center in Washington, DC, for a safe, legal abortion. She bled to death. Marla Anne Cardamone (pictured) was 19 years old when she was browbeaten into her fatal abortion by a social worker at Magee Women's Hospital in Pittsburgh. Margaret Clodfelter was 19 years old when she had a safe and legal abortion at Richmond Medical Center For Women on June 2, 1989. She developed an infection and died, leaving behind a husband and a one-year-old son. Glenda Davis, age 31, mother of two, said that she underwent a safe and legal abortion performed by Robert Hanson at Aaron Family Planning March 11, 1989. She bled to death. Synthia Dennard bled to death from a combination abortion and tubal ligation -- sold to her when she was not actually pregnant. Gladyss Estanislao was found dead on the bathroom floor near her college classroom after her abortionist failed to diagnose her ectopic pregnancy. We know that the CDC did not count her, because they decided to count all ectopic pregnancy deaths separately, even if the failure to make a timely diagnosis was due to an abortionist's errors. Glenna Jean Fox, age 17, bled to death after a second-trimester abortion. Laura France, 33-year-old mother of four, was found dead in her garage, where she had attempted an abortion with an air compressor. Debra Gray died of anesthesia complications at Maryland's infamous Hillview abortion mill. Karretu Jabbie, a 24-year-old woman from West Africa, underwent an incomplete abortion and bled to death on November 2, 1989. Catherine Pierce languished in a coma for seven months before leaving her 11-year-old daughter motherless. Erica Kae Richardson was brought for a secret abortion by her aunt. Debra Walton, age 35, died of septic shock from her abortion.